I had a feeling I’d spent a lot of time blogging this year and I’d gotten the distinct impression that I’d written a lot of words. As it happens, that’s because I’ve written 149 blog posts in under 11 months. I’ve had the chance to review the most incredible range of books and events, and needless to say, I’ve had an absolute ball doing it. I hope you’ve enjoyed it too! Today’s post is the 150th blog post for That Book You Like… and I’m very excited! So much so, I thought I’d mark the occasion with a very special announcement. As you know, I love books. Not just that, I love talking about books and by the looks of it so do lots of other people. I’ve really enjoyed being part of a book club this year, especially as it’s not something I’ve had the time or the opportunity to do in the past. Beginning in January 2012, That Book You Like will be launching a brand new online book club!! The TBYL Book Club will, each month bring you a new, exciting book to read, discuss and share. We’ll be suggesting a variety of titles over the year, encouraging you to read widely, differently and adventurously. You’ll be able to opt-in and opt-out as you like, depending on whether you’re interested in the book of the month. 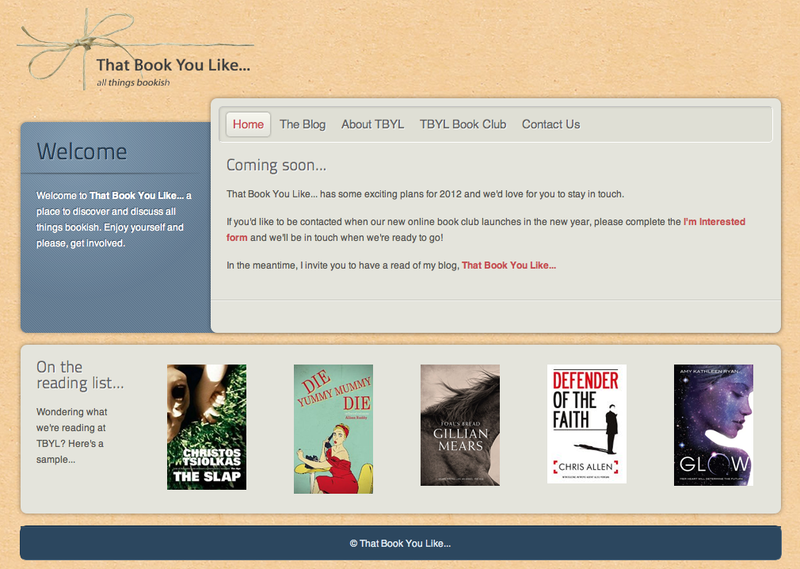 The TBYL Book Club will allow you to connect with fellow book-lovers in our online community (to be launched in Jan 2012), and to get involved in an amazing range of online forums about the book of the month. The Club will give you the chance to win prizes, access to special offers and invites to exciting bookish events. And best of all, it’s free to join! To mark this special 150th Post Day, I’d like to invite you all to visit my new website at www.thatbookyoulike.com.au and if you’re interested in being contacted when the TBYL Book Club launches in the new year, please fill out the I’m Interested form so that I can drop you a line when we’ve picked our very first book. Again, I hope you’ve enjoyed That Book You Like’s first 150 posts, and I hope you’ll join us on this next exciting adventure! Thanks so much Jess, thanks for signing up!! and Hooray indeed – I’m very excited!! Well done, Mandi – congratulations on your new website and your 150th post. Your book club is a great idea, and I wish you all the best with it. Thanks so much Karyn, I’m really looking forward to it kicking off asap!! Can’t wait to hear what every body makes of some of the great lit out there! I’m so excited! Your post made my day! I’m so in! I’ve been looking for a book club on and off for nearly 3 years, but then something happens and committing becomes hard – this is perfect! How exciting! I’ve signed up! !